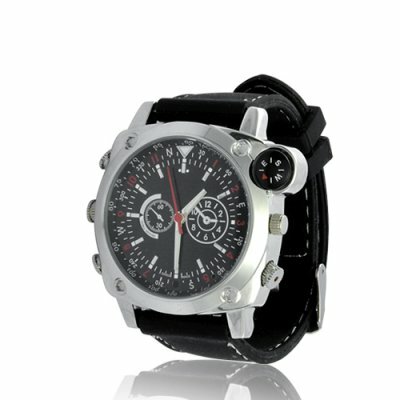 Successfully Added Maritime Recon - Waterproof HD Watch (4GB) to your Shopping Cart. Maritime Recon Waterproof Watch - record videos, voices, images in High Definition and totally undercover, even in deep water! This great clock is waterproof. It means you can take videos and photos at the beach, swimming pool or even in wet areas. Consider also a waterproof MIC cover is provided and the most outstanding secret missions become possible! What more? With its huge 4GB of internal flash memory, you are sure to have enough storage space for hours of top secret videos and thousands of hot pictures. The Maritime Recon Waterproof Watch is suitable for both professional and amateur recording. This fantastic gadget is in stock right now and brought to you at a factory direct wholesale price from the leader in wholesale electronics and gadgets, Chinavasion. Please note: The compass does not work and is for decoration purposes only. I wore it to work today and nobody took any notice of it, after all, it's just a watch. The user needs to spend some time working out the best angle to hold the watch to take video or pictures. I tried pictures and some were good but some were great shots of the ceiling, but they were clear and recognisable. With this watch I will be able to record the meetings I have to go to when the bosses forget to tell us things, and I will have the evidence. Good price, good looks and I'm sure it will have many uses.